NAC Competitors – Register for High Sierra and more! 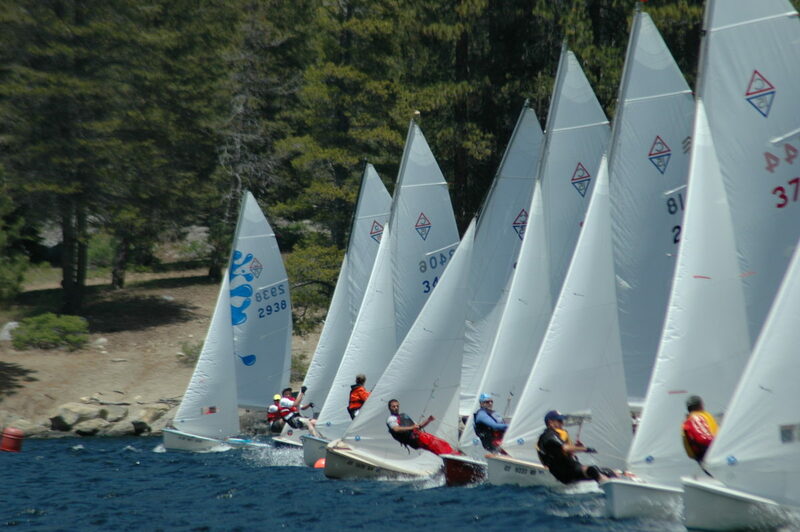 Hey, I wanted to get the link our to people so that they start registering for High Sierra regatta portion of our NACs as soon as possible. They currently have us slated to start with the Thistle fleet, but said they would look into getting us our own start if we have the numbers to warrant that. We need to hear from everyone to get a sail count! Register early to help us all and save on late fees. 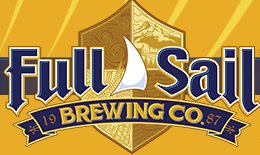 The 2018 NAC is sponsored by Full Sail Brewing co. 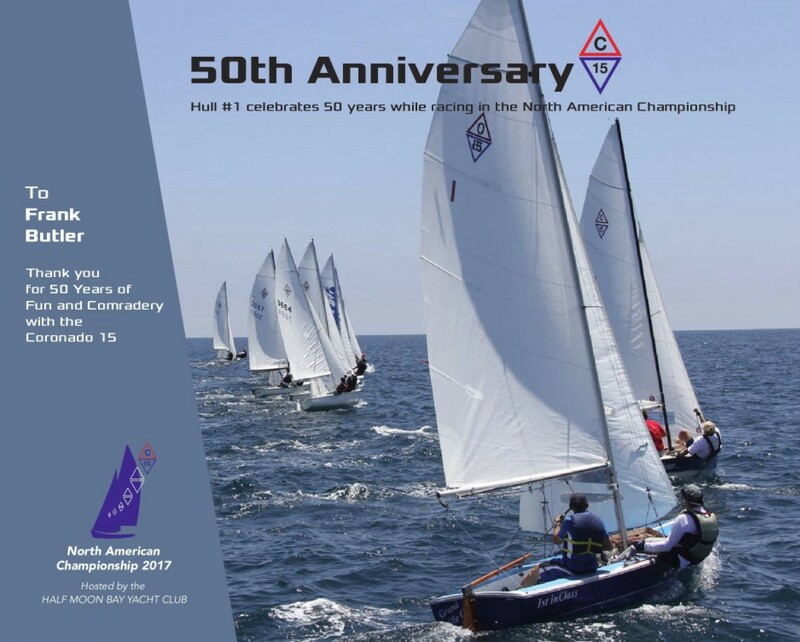 This year we celebrated 50 years of C15 sailing in Halfmoon Bay with Hull #1 in all its splendor. Next year we are coming back to Huntington Lake July 12-15 for the first time since 2009. Let ‘s show up in force and compete for the championship in one of the most celebrated sailing venues. Note: While this is almost a year away, consider the limit on the maximum number of boats on the lake for that weekend and you do not wish to be the boat whose entry into the High Sierra is refused for going over the limit. Since the lake was closed for a few years due to drought, it has been a sought after venue now that it is back to its legendary conditions. From prior experience, it is a good idea to book a condo early. I will post some old pics of Huntington sailing in this web site to wet your appetite. Mark your calendars! 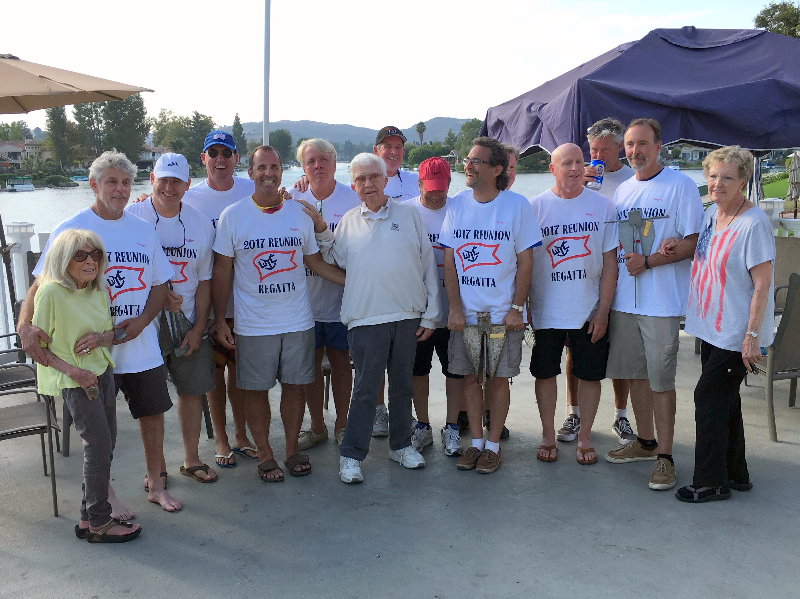 This particular group first met about 40 years ago, before and as the Westlake Yacht Club was being founded. 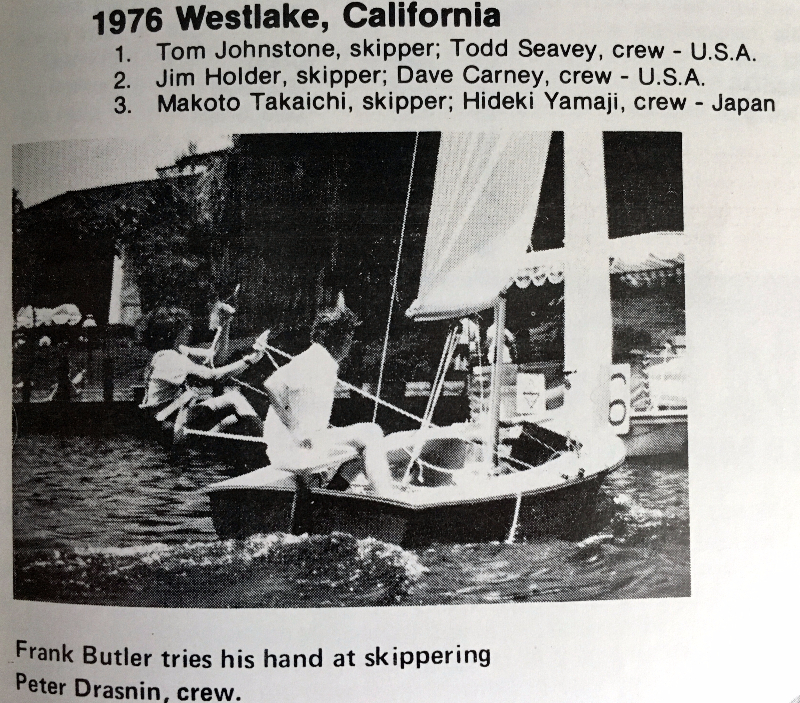 Jim Holder founded the Westlake Junior Sailing program and started the sailing on Westlake with the launching of the first and only for‘some time, sail boat on the lake. WLYC began as the Westlake Sailing Association, a motley group of kids and parents who sailed on the lake back when it was being built and in the early days of being settled. Jim Holder was a founding member of WLYC. After WLYC was formed, we started the tradition of having summer sailing camps for kids which continues to this day, and all of us sailed in those camps and got to know each other. Many of us formed lifelong friendships which persist to this day, despite the fact that most have left the area (I am the only WLYC member left). We all began sailing in Sabots – at first, “Westward” sabots, and then later “Sidney” sabots – and moved up to Banshees (! ), Cyclones (! ), Lasers, Lidos, and of course C-15s. In the group pictured below there are quite a few C-15 champions represented. Don Long and I first thought of the idea for this regatta two years ago when sailing together at the C-15 Nationals in Marina del Rey. 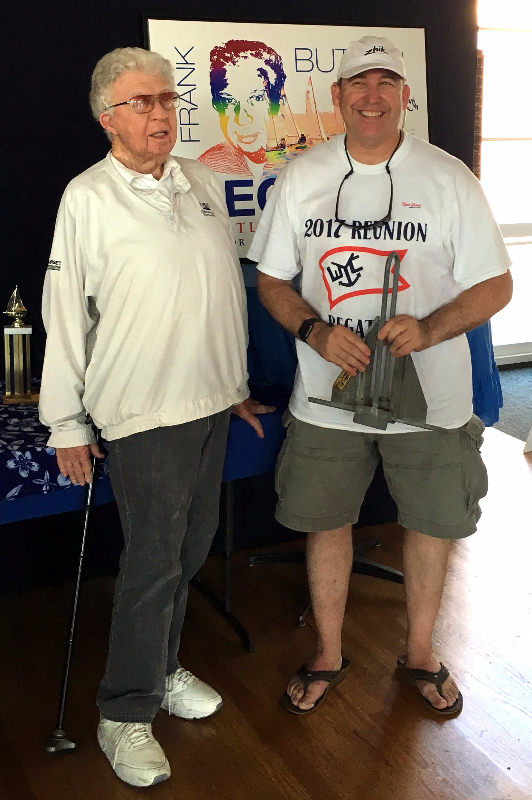 We realized that the WLYC Labor Day regatta – which was renamed a few years ago to the Frank Butler Regatta – would be perfect, and started making plans. Fourteen sailors showed up, along with their families, friends, and significant others, and we had a great BBQ Sunday night, and of course the round-robin Reunion Regatta on Monday. LtoR: Elsie Elliot (Mark Elliot’s Mom and Allan Elliot’s wife), Mark Elliot, Peter Drasnin, Mark Bratton, Ole Eichhorn, Don Long, Frank Butler (! ), Jim Shaw, Brad Herman, Glen Uslan, Allan Linnemeyer, Jim Biram, Jason Vandenberg, Dave Carney, and Iva Holder (Jim Holder’s ex-wife). Jim Holder attended and sailed but is not in this picture. As luck would have it, I was just given by Joe O’Reilly from Long Beach a set of association archives going back to the early days of the C15 (1968 and on) where I stumbled upon this 1976 picture of Frank Butler and Peter Drasnin then… and now. What a special event it was.